I had the chance this week to see an old copy of BT’s Technology Journal, published at the time of the millennium. To give you an idea of how long ago the year 2000 actually was, the cover trumpeted an interactive version of the journal on CD-ROM that delivered a multimedia experience. What was most interesting were a series of technology timelines, across areas as diverse as health, home and entertainment that predicted what the world would be like in 2020 and beyond. By now (2013) we should all be watching 3D without glasses, using robots in the kitchen and the police will be equipped with phasers (as seen in Star Trek). Looking forward by 2015 we’ll be able to pleasure ourselves with the Orgasmatron (though I’m sure that was in a 1960s Woody Allen film). It is really easy to laugh at predictions made 13 years ago, particularly as they spectacularly failed to imagine things such as tablet computing and Facebook which have changed our lives and disrupted industries. 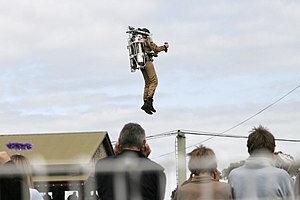 I remember Tomorrow’s World back in the 1970s happily demonstrating the jet packs we’d be using to get around by the turn of the millennium. I’m still waiting for mine to arrive. The reasons that futurologists get it spectacularly wrong are two-fold. Firstly, progress is not linear. Moore’s Law may apply to computers, but not to everything. Creating artificial organs does not mean that we’ll have artificial brains ten years later. Research simply doesn’t work like that and is much more stop start. Even now, eureka moments can move things forward rapidly or development can hit a dead end. The second, and most important factor, is about user acceptance – and this is where startups and innovators need to pay most attention. Just because technology can do something doesn’t mean that people will want to pay money for it. I’ve talked at length about how startups need to cross the chasm and create products that the mass market wants, rather than just early adopters. This is where a lot of the innovations predicted by BT (and plenty of others) fail. There simply isn’t a compelling reason for people to either change their behaviour and/or fork out significant amounts of money to take a risk on a new innovation. Understanding consumer behaviour and designing products to meet their needs is vital if new innovations are going to make it out of the lab and into the mainstream. Yes, we can create 3D TVs that don’t need glasses, but the cost is currently prohibitive. We could probably even build jet packs, but the legal framework isn’t there to control their usage.